If you have a sectional Premier party tent and want to enlarge it, this 100-foot Premier party canopy mid section tent is perfect for you. It will provide a place for you to have a successful event in the face of elements that may normally cause you to have to cancel that event. The quality is remarkable with the blackout material, giving you unmatchable protection from sun, wind, rain, and snow. 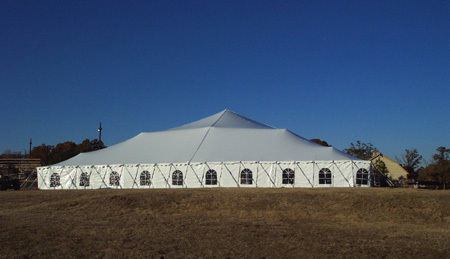 This tent will be large enough to host a sizeable event successfully. It comes with a carrying case, tent top (with guy ropes), galvanized side poles, center poles, quarter poles, and tent stakes, and a patch kit. You will have everything you need to successfully hold an event outdoors. What is the difference between the 100 foot premier canopy and the 100x100? The item you have linked to is a mid section only, intended for the purpose of expanding an existing sectional Premier Party Canopy Tent.